Twitter Users are increasing more and more day to day. 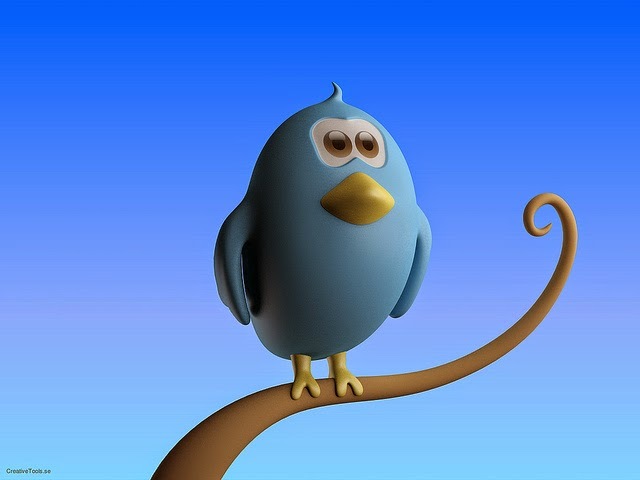 When you start using twitter frequently you may want to use something that ll make it easy for you to tweet at times when you can't be online all the time. There comes the usage of twitter management tools which will help you manage your twitter accounts (even multiple accounts too with some cents spent). But then you want something that will let you tweet more than the tweet characters limit which is obviously 140 as you know it. Basically, twitter is designed as a Short Messaging Service (SMS) and you can't blame for what it is. There are many third party tools, that make use of the twitter's API facility and are created to fullfil your reason to tweet longer tweets more than 140 characters. With that in mind, I am going to share some of the 4 tools that will let you tweet more than 140 characters. This is the one that comes to my mind when I first think about tweeting longer sentences more than the character limit. You may know it obviously, the make of this application., Yes, you guessed it., Amit Agarwal, a professional blogger from India. This tool is a simple one with you can tweet more than 140 characters in two forms. Tweet as text which will split the full lengthy tweet into chunks of tweets that apply the tweet character limit. Or tweet as an image which will create an image of the tweet message and send it to twitter as one media tweet which looks good by the way. Twitlonger is one tweeting tool which attaches a link to your tweet and let the users view your tweet on twitlonger site. Also you can reply to the tweet that you sent or any tweet that is sent from the site. Twishort is another one tweeting tool where you can tweet longer than 140 characters with a link attached to your tweet. The users can view the full lengthy tweet when they click the link which will take you to view the lengthy tweet in your account at twishort. One different feature other than the above tools is that it has also a facility to reply to any specifc tweet. All you have to do it to copy and paste the twitter url link for the tweet that you wanna reply to. 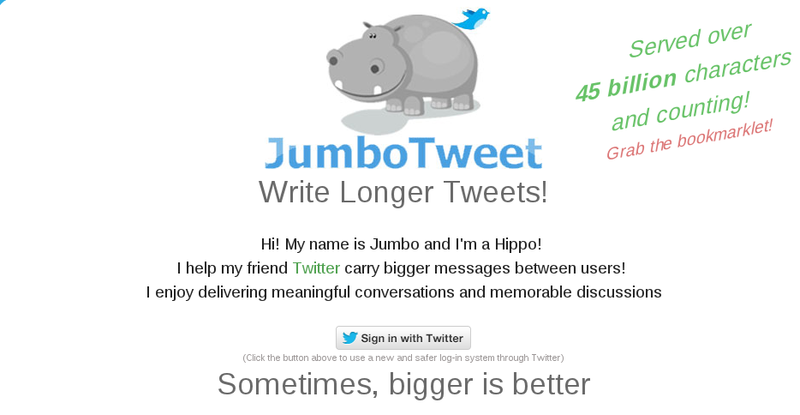 Jumbotweets is another platform to tweet longer than 140 characters to your twitter account. This works the similar way as the other tools,. tweets the lengthy messages with a link attached to it at the end of each tweet. It is used as a microblogging platform service where you tweet with a link and the users can view the full tweet in its website. 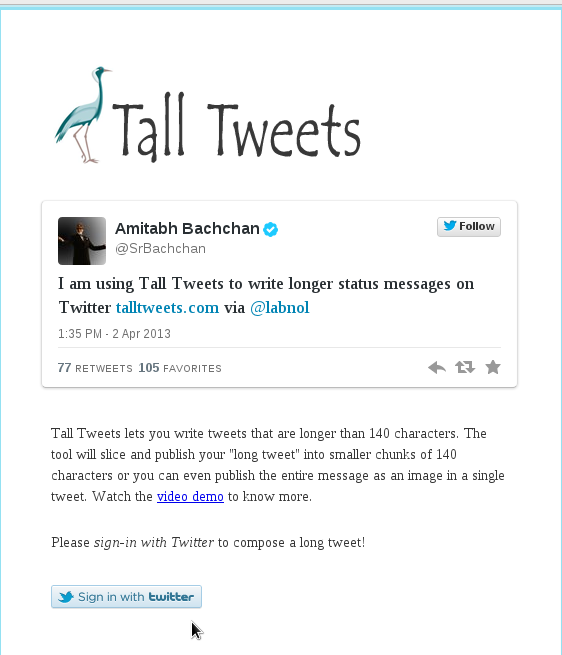 P.S : A new service from us LongerTwits has come out to tweet longer than 140 characters and more. Currently we've Tweet as Text facility where your tweets are split into chunks of 120 characters each and sent to twitter. Tweet as Image facility will let you tweet your lengthy messages in an image format. (Inspired by TallTweets). Tweet as Link will let you tweet your messages by attaching a link at the end of your tweet which links to your complete text in our site. Soon, we'll provide the option to save and collect your tweets (last 3200 tweets). Stay Tuned with our posts and let us know your feedback in the comments. I'm using Twitpress (http://www.twitpress.co). Simple, clean and easy. This list is obsolete. I can't see by any part TweetBeeg and Twetpeck. What about that amazing webs? The list above only shows 4 of the tools. There are n number of apps to tweet longer than 140 characters.If you'd like, you can list your favorites below for the readers. And do check out my own app to tweet longer than 140 characters as well if you please. Hi!, very interesting article, I usually use tweenjoy.com, besides being able to write more than 140 characters, you can personalize it with backgrounds and colors! By the way, very interesting also your app Vicky! I recommend to use www.tweetbeeg.com. It is the most complete tool to write more than 140 characters because it is like the four apps that appear in this post and with a better design.